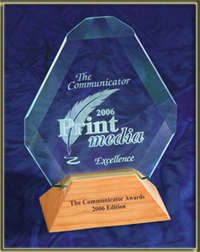 Three communication programs managed by the CCGA National Office were presented with Awards at the 2006 Communicator Awards Print Competition. The Auxiliarist Newsletter was presented with the prestigious Award of Excellence while the CCGA Corporate Brochure and the ISAR 2005 Promotion Kit were presented with the Award of Distinction. The Award of Excellence is presented to those entrants whose ability to communicate elevates them amongst the best in the field. The Award of Distinction is awarded for projects that exceed industry standards in design and communication skills. In 2006, there were 5,214 entries submitted in this international competition. The CCGA was one of six winners from Canada.